Jakarta, Indonesia (CNN) -- An Islamic cleric was arrested Monday for playing a key role in the establishment of a militant training camp in Indonesia's Aceh region, authorities said. 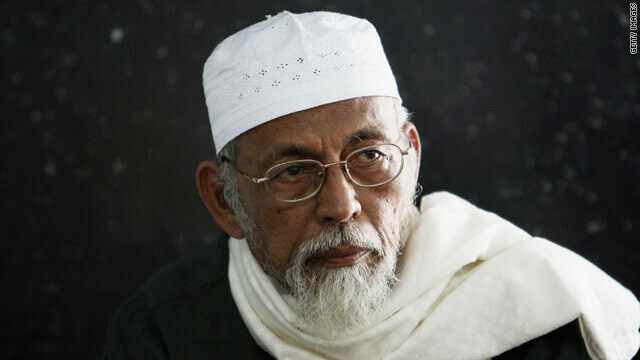 Abu Bakar Bashir -- a religious leader known for his anti-Western rhetoric -- has been arrested twice previously for his activities in connection with militant groups. He was detained early Monday in West Java and was later brought to the National Police Headquarters for further questioning. Authorities have strong evidence that Bashir played a role in establishing a terror cell and a militant training camp in Aceh province, said National Police spokesman Inspector General Edward Aritonang. Police raided that camp in February and arrested dozens of militants who were allegedly planning terror attacks in Indonesia similar to those that took place in Mumbai, India, in 2008. Bashir knew about that camp, helped fund it and appointed religious teachers to provide the militants with spiritual guidance, officials said. He also allegedly appointed an extremist fugitive known as Dulmatin as the field commander. Dulmatin was killed in another police raid shortly afterward. In May, several members of a hardline organization Bashir founded -- the Jama'ah Ansharut Tauhid, or JAT -- were also arrested and charged with raising funds for the training camp. Following months of speculation on Bashir's involvement, police said it's clear he played a key role in setting up the terror sell that wanted to base itself in Aceh. Police also uncovered a new plot by a terror cell to launch fresh attacks on the national police headquarters and several unnamed hotels and embassies in Jakarta. This information came about after the arrests of four people over the weekend in West Java. And police said the terror cell put up a laboratory to test bombs and twice blew up explosives in a remote area in Sumedang, West Java. A French national allegedly supplied a car to the suspected terrorists to use for a car bomb, according to authorities. The French national is still at large. Bashir was first arrested after the Bali bombings in 2002 where more than 200 people were killed. At the time, he was the spiritual leader of Jemaah Islamiyah, whose stated goal is to create an Islamic state comprising Malaysia, Singapore, Indonesia and the southern Philippines. He was charged with rebellion, terrorism and immigration violations. Prosecutors convicted of him of immigration violations and rebellion, but the latter conviction dismissed on appeal. Bashir served 18 months in jail. Two years later, before his expected release in 2004, Bashir was arrested again on charges of helping incite the August 2003 bombing of the Marriott hotel in Jakarta. He served two and a half years in jail and was released in June 2006. In 2008, Bashir established Jama'ah Ansharut Tauhid. "I'm sure the police have a very strong case. They would not arrest him for the third time otherwise," said terrorism expert Sidney Jones of the International Crisis Group, a non-profit that works to prevent and resolve deadly conflict. "It's a mark of police confidence that they would go forward with this arrest, and attests to the weakening of the radical networks. But Abu Bakar Bashir's influence has been declining. So, the fact that he's been taken out of circulation again will not have a major impact one way or another on the security situation."